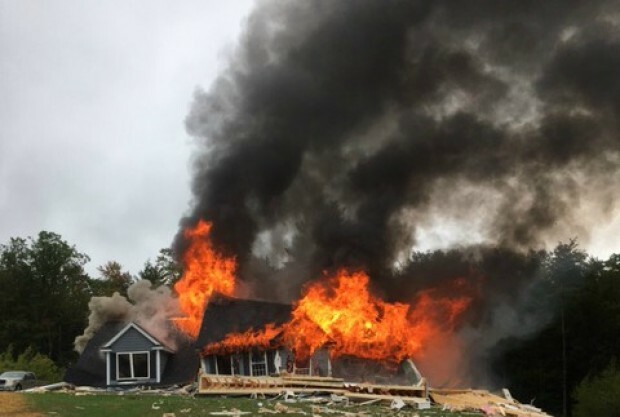 A worker who was inside a New Hampshire home when it exploded Tuesday morning has died from his injuries, authorities confirmed. 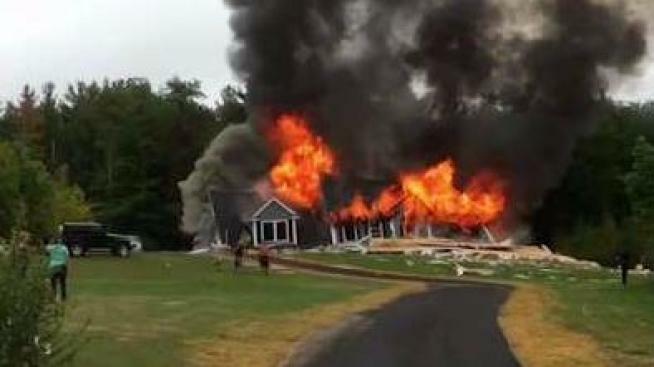 A worker who was inside a New Hampshire home when it exploded Tuesday morning has died from his injuries, authorities have confirmed. Antonio De Souza, 46, of Nashua, died from the injuries he sustained when the home on Foxberry Drive in New Boston exploded, caught fire and collapsed. Images from the scene showed the home consumed by flames, with the roof collapsing in on itself. Firefighters from several area towns were still on the scene into the afternoon trying to get the flames under control. Flames shoot from a home on Foxberry Drive in New Boston, New Hampshire, following an explosion on Tuesday. "We heard a big bang and I thought all my windows blew out of my house," recalled neighbor Maryanne Willander. Police said the 10:30 a.m. explosion rocked the home under construction and sent debris flying hundreds of feet. Fire officials said shockwaves were felt as far as 15 miles away. "The whole house shook," Foxberry Drive resident Mike Stanley said. A worker, later identified as De Souza, had been inside the basement painting when a propane tank exploded, authorities said. Fire officials said neighbors ran to the house and heard De Souza screaming, trapped inside the basement. "They knew there was somebody injured inside the house," District Fire Chief Danielle Cole said. "He said that he was hurt and he was unable to move." De Souza had survived the explosion but died in the subsequent fire and collapse. His body was recovered around 2 p.m. Neighbors said they are in shock over the tragedy. "We’re offering prayers and support for whatever happened and whoever was involved," neighbor Kathy Zukowski said. "It’s the only thing, the best thing we can do." Authorities said the fire ripped through the first floor of the home, causing it to collapse. The second floor of the home was left mostly intact. The exact cause of the explosion is still under investigation.